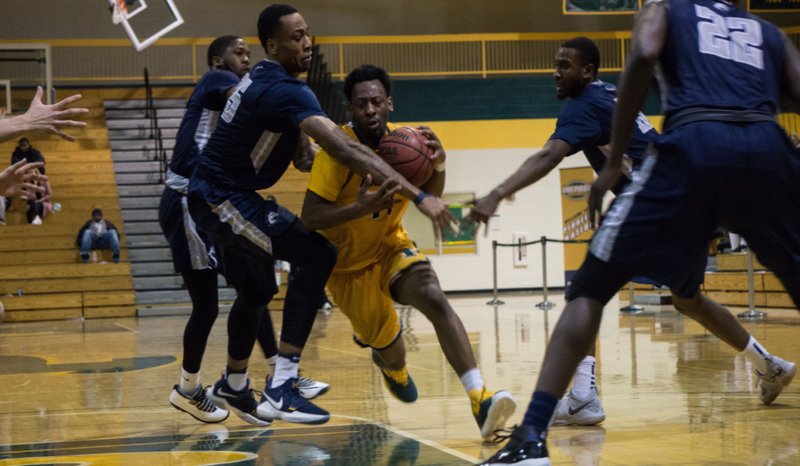 On Feb. 3, the men’s basketball team played its first home game since Jan. 17 against Mercy College, winning with a score of 79-67. Jared Rivers, a sophomore physical education major made three straight three pointers. The game opened with a missed jump shot by Mercy College followed by a rebound from senior guard Aary Bibens, an international business major, that led to a 3-0 lead for the Pioneers from a three point shot from Bibens. The Pioneers were able to hold a 14-0 score against Mercy College for just over three minutes, converting seven of their first 12 shots. Ten minutes into the first half, the Pioneers were ahead of Mercy College, 23-7, which continued as they held the lead at a score of 48-26 after the first half. When the second half started, the Pioneers had a lead of 22 points; however, the Pioneers missed their first six of eight field goals and turned the ball over three times, earning Mercy College 18 points off of turnovers by the Pioneers. Fortunately, senior forward, criminal justice major, Hunter Powell was able to get it done from the free-throw line by recording four points. With just over six and a half minutes gone in the second half, sophomore guard, physical education major, Jared Rivers made three straight three-pointers. The Pioneers will play their next game at home against Molloy College on Wed., Feb. 7 at 7:00 p.m.